I used to (and probably you too) think that our duty to secure PC ends after installing Antivirus software. However, that is partially true. One should not rely on single type of defense but multiple layer of security considering how dreadful malware have become. It is the latest version from Microsoft and will have a benefit of continued support and updates. This include regular patches and fixes to the vulnerabilities found in the system architecture. SecureBoot is a component of Windows 8 operating system to help prevent malicious software applications and “unauthorized” operating systems from loading during the system start-up process. There are concerns that you won’t be able to install Linux as dual OS with SecureBoot. But then, it is a step taken to restrict malware from loading not Linux. When you are logged in as administrator, you have escalated privileges to make changes to system files. So, it is recommended to use another user with standard privileges so that even if malware tries to attack, it will be locked down due to lack of administrator privileges. Uninstall all the crap and unused stuff from your Computer. Not only this will save space but also prevent infection from spreading through them if any. Check out these 6 tools to clean up Windows and uninstall unused. Keep track of outdated software programs installed for they maybe more vulnerable to attacks. 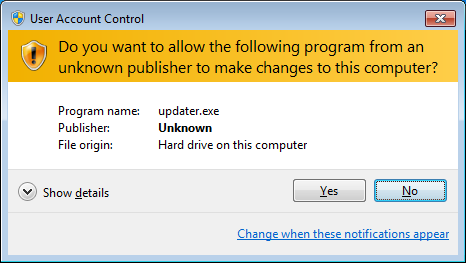 Whenever a program tries to modify system files, User Account Control makes sure these changes are made only with approval from the administrator. So, you get a popup notification whether it should be allowed or not. If you think that the application asking for permission is not legit, it wont be given further access to make any sort of changes. I know it is difficult to remember unique passwords for each and every site you register. So, I personally recommend using LastPass to do this task for you. Also, you may opt for using a secure password generator website if you want to remember them by yourself. Really an informative post, thanks for sharing these useful tips. nice collection if securing our pc. and you are right we must use different passwors for dufferent files. so that we can secure our files. Please tell me, How can I kept safe my pc from Malaware virus and Which anti-virus best to use.